To some, shaky-cam has become synonymous with low quality. But not the way Paul Greengrass does is. The director doesn’t just do shaky-cam–he masters it. Every single movement is perfected and deliberate so that during fight scenes, we still know exactly what’s happening all while getting the feeling that we’re involved. The pacing is pretty much perfect in the third installment of the spy-thriller series. We pick up weeks after the events of its predecessor, and Jason Bourne (Matt Damon) is still trying to figure out his forgotten past. The secret CIA program which was once called Operation Treadstone is essentially the same, except operating under the name of Blackbriar. Dipping and dodging different assassins, Bourne is one step closer to finding out how he became an important piece in all this. But this time, there’s more desperation. More urgency. He knows he could be dead at any moment and possibly should have been dead already. But he’s not and he doesn’t know how much longer he can cheat death. We feel it too. We want him to find everything out before he gets killed. It’s this energy that runs all through The Bourne Ultimatum that keeps you on the edge of your seat the entire time. Bourne’s character depth doesn’t really progress anywhere from the last film, but we don’t really feel like it needs to. He doesn’t say much, but we can read his thoughts much of the time. In the end, we’re relieved, but not necessarily satisfied. There is still more to be found out. Although in the moment, we aren’t aware that there will be more sequels to come. We just hope that there are. It’s definitely better than Ocean’s 12, but slightly less phenomenal as Ocean’s 11. While it’s slightly harder to follow than the latter, I’m so glad to see them back in Las Vegas because that means the return of the glamour that the first one had and the second one lacked. The con is also catalyzed by revenge and nothing else–also like the first film. The jokes are still laughable and there is more character presence, but it’s not as personable as the character who they’re getting revenge for is hardly a presence in the film. So when it’s over and done with we don’t have as much to cheer about. But I will say that the con in this one is brilliant and I love how they’re on a much more unselfish level this time around. That’s pretty much the whole theme to the movie. 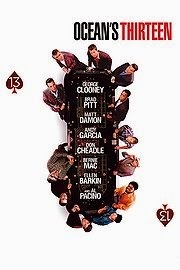 If you liked the Ocean’s 11 and 12, then you’re guaranteed to enjoy the 3rd installment in the franchise.